This simple kale & egg is the perfect weeknight meal. Everything is cooked inside a sheet pan, and it takes only 15 minutes to make! Lately, I’ve been using a lot of kale in my green smoothies, but roasting kale is actually my favorite way to prepare the vegetable. I love the slight crunch of roasted kale, particularly the kale on the edges of the roasting pan. You can toss them with a bowl of grains and your favorite protein for a satisfying meal or add them to a salad. 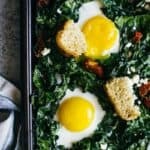 You can even bake the kale with eggs for a light meal! Over the past few months, I’ve been asking readers what types of recipes I should share on the blog. 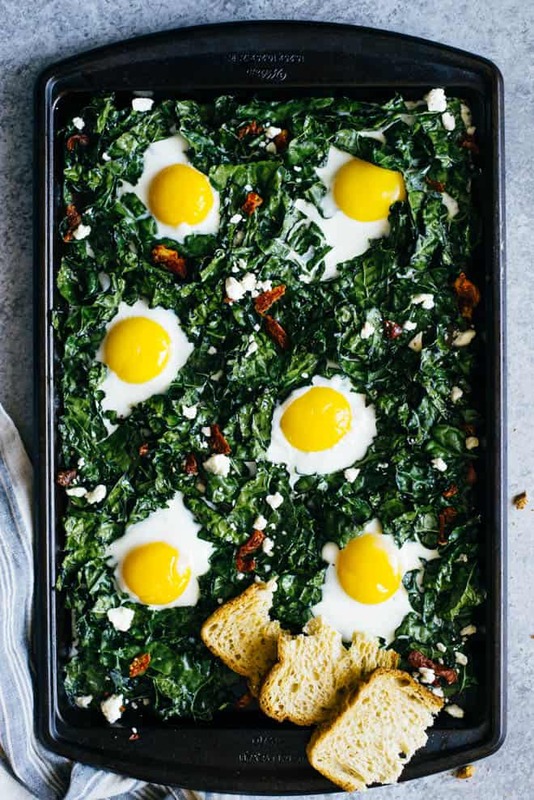 Many of you requested quick and healthy vegetarian meals, so this sheet pan kale and egg bake is for you. I like leaving the egg yolks runny so that I can mop them up with toast. The entire dish is ready in 15 minutes, and it’s perfect for breakfast or light dinners. Using dark vs. light baking sheets: Because darker colored baking sheets heat up faster, the eggs will cook a lot faster. It took me 6 minutes to cook the eggs in the dark baking sheet you see in the photos. If you use a lighter baking sheet, you may need to add a few minutes to the cooking time. Grease the baking sheet: The eggs will stick to your baking sheet once they’re cooked, so be sure to grease your baking sheet pretty generously. Even if you’re using a non-stick sheet, make sure to brush or spray oil on there. You don’t want to spend 10 minutes scrubbing egg whites from the pan like I did. For crunchier kale: If you want the roasted kale to be more like chips, bake the kale on the baking sheet for 4 to 5 minutes first before adding the eggs. Substitutions: Instead of sun-dried tomatoes and goat cheese, you can top the kale and egg bake with parmesan cheese, olives or feta! Also, you can substitute the kale for swiss chard leaves. The texture will be different than kale, but it’ll still taste good. The perfect sunny-side up eggs: If you want your eggs to like like the ones in my photos, separate the egg whites from the yolks when you crack the egg. Make sure the egg whites go inside the hole first. Then, gently lay the yolk on top of the whites. Preheat oven to 375ºF (190ºC). Brush 1 to 1 1/2 tablespoons of olive oil over a medium rimmed baking sheet, enough to coat the baking sheet. You can also use cooking spray. Set baking sheet aside. Toss the chopped kale with the remaining tablespoon of oil. Sprinkle a pinch of salt on the kale and use your hands to massage the oil into the kale. Spread kale on baking sheet. Push the kale around so that you have 6 holes in the baking sheet. Crack one egg inside each of these holes. Bake kale and eggs for 5 to 10 minutes, until the egg whites are no longer runny. Start check the eggs after 5 minutes to see if the whites have settled. If you’re using a dark baking sheet, the cooking time will be shorter. Different ovens distribute heat differently, so the cooking time can vary. Pull the baking sheet out of the oven. Sprinkle chopped sun-dried tomatoes and goat cheese on top. Season with salt and pepper to taste. 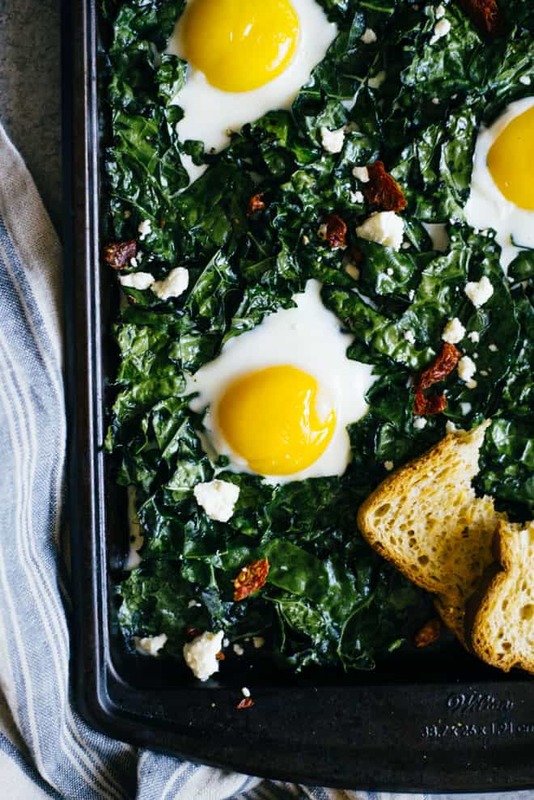 Serve the kale and egg bake with toast. 1. 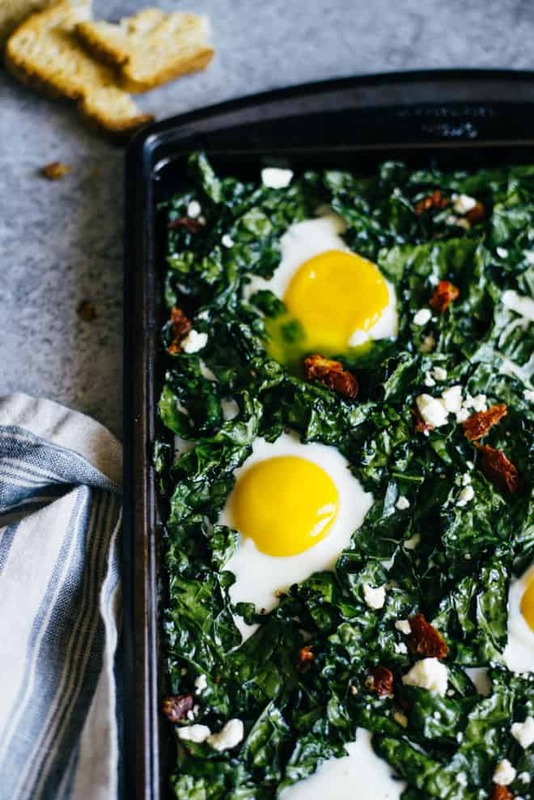 For crunchier kale: If you want the roasted kale to be more like chips, bake the kale on the baking sheet for 4 to 5 minutes first before adding the eggs. 2. I don’t like eating kale stems. I usually remove the leaves from the stems before chopping them up to smaller pieces. 3. If you want your eggs to look like the ones in my photos, separate the egg whites from the yolks when you crack the egg. Make sure the egg whites go inside the hole first. Then, gently lay the yolk on top of the whites. Kale and eggs taste so amazing together! I totally agree with you; slightly crunchy kale is so delicious and the runny egg yolk would most definitely balance out the kale flavours. Love this combo! P.S. 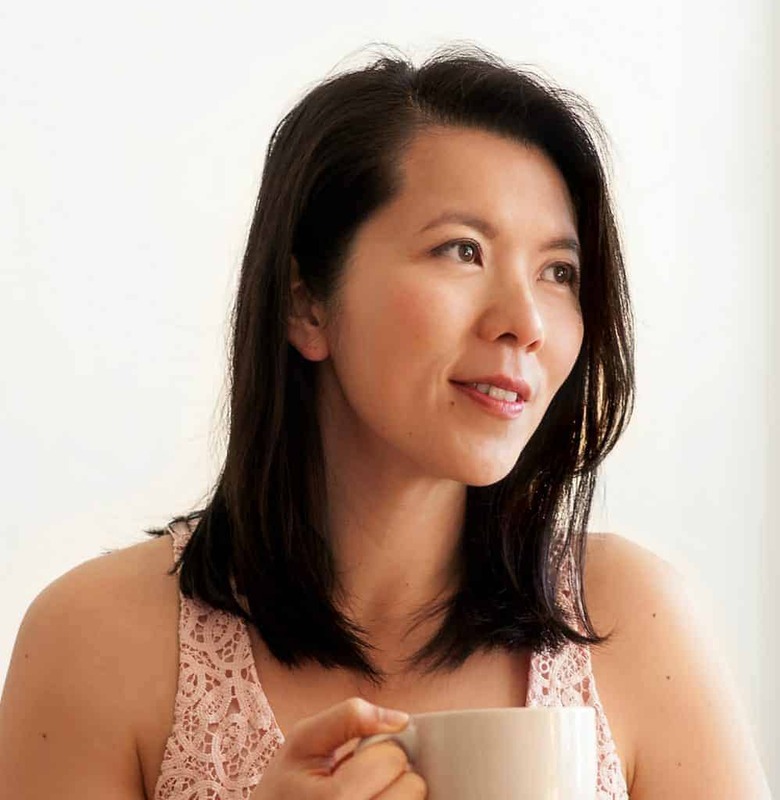 I’m also a lawyer turned food blogger – love your blog! No way, Jessica!! We are like kindred spirits! I wish I can meet up with you some day and hear your story! Hi Gem! If you can’t do cheese, you can just leave it out completely. The cheese is just for extra flavor. You can also try sprinkling on a tiny bit of nutritional yeast. It’s used a lot in vegan cooking to mimic cheese flavor. Chopped olives work well, too. Hope this helps! Thank you, Sonali! I’m glad that someone finds my tips useful!! what a great idea! I never thought to do eggs on a sheet pan! yummy breakfast! This sounds great! Heading out to Sunday Morning Market and will surely find kale and eggs. I’m so making this for lunch. Love the seperate the eggs first tip. Let me know how it went, Gina! Can you use spinach instead of the kale?? Yes! However, I recommend just sauteing the spinach. Spinach leaves don’t have as much structure as kale, so it won’t be able to handle the oven heat for a long time. What a beautiful dish. My son recently decided he no longer likes vegetables, after eating them so well at the beginning- but I was sauteeing kale to make little omelet cups the other day, and he started eating the kale out of the muffin tin! Now I saute is every day with olive oil, s&p, super simple, and he just eats it like it’s fruit or something. Kids are so weird! So, this breakfast dish would be perfect for my family. Thank you, Michelle!! That’s so funny how kids change their taste by the day! Well, I’m so glad that he likes kale at least! Lisa, yet again this one is a winner! Congratulations. I tried this recipe on Monday evening and it was delicious. I did go off script slightly – I added in fried sliced onions and halved cherry tomatoes on top of the kale, along with a sprinkling of chilli flakes. This is such a quick and easy mid week supper or brunch dish to do and healthy! Fay, thank you so much for trying my recipe and for letting me know how it turned out! You additions sound wonderful. I LOVE the idea of adding fried sliced onions on here. Thanks again! Is this something you can make ahead? If this is for one, will it be ok to eat the next two days in a row or just eat fresh?? Hi Melissa, because the egg yolks will still be runny, I would recommend eating this right when it’s done cooking. If you want to prep this for a few days ahead, you will want to leave the sheet pan in the oven longer so that the egg yolks cook completely. I was definitely skeptical, especially since I’m “meh” about kale. I tried it because this recipe would use lots of kale (which has been sitting in my fridge too long) with minimal prep. It. Was. Amazing. I just ate almost the whole pan in about fifteen minutes (not good!) for dinner. I didn’t even use all ingredients you had listed–no bread, no sun-dried tomatoes–and it tasted great. Just kale with olive oil and salt and pepper, and the egg on top with some cheese. Fast and delicious. Off to check out some of your other recipes. Dee, thank you SO much for trying out the recipe and for letting me know how it went! Glad you enjoyed it! I don’t like runny eggs, how long should I cook them? Thx!! Hi, Tonya! I would start checking around 9 to 10 minutes to see if the yolks have settled. If not, just cook it for another minute or two. Hope this helps! Awesome! Thanks so much, can’t wait to try this!!! I made this today to get rid of some leftover kale in the fridge. It was excellent! Not sure how it affects the overall healthiness, but for what it’s worth I also drizzled creme fraiche and sprinkled parmesan cheese over the sheet pan prior to baking and I was very happy with the results. Thanks for trying the recipe, Ramesh! Your additions sound great! 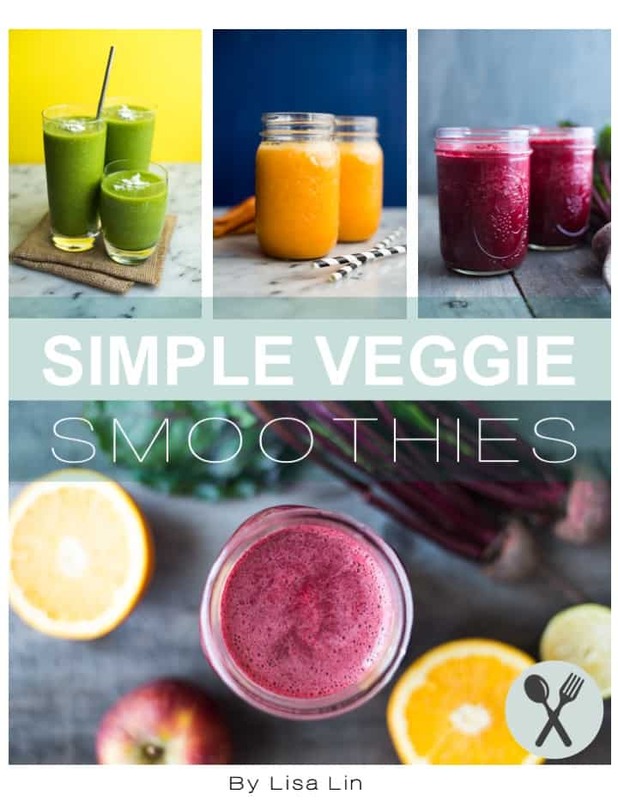 So quick and yummy! I had some kale in my cold frame, so it was the perfect supper to make, and I even had some goat cheese, which made it especially delicious. Thank you! YUM! I didn’t have the cheese or tomatoes, so I added garlic and paprika. I didn’t need the toast! It’s delicious on its own! This for brunch today and it is supper easy & fast….I did substitute the sun dried tomatoes as I did not have any and used black olive and feta and added a side dish of sliced tomatoes. It is fast and delicious. Thanks so much for sharing.